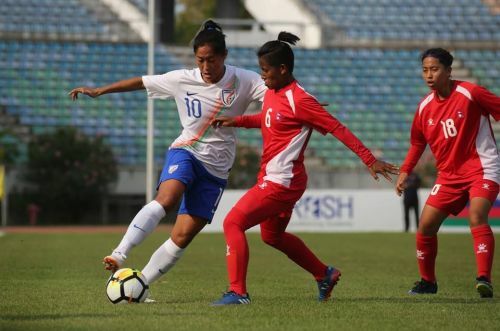 The Indian senior national women's team began its campaign in the first round of the 2020 AFC Women's Olympic Qualifying Tournament with a 1-1 draw against Nepal on Thursday (November 8) at the Thuwunna Stadium in Yangon. The first half was an open affair, with India having the edge in terms of the chances created. However, they did not have the best of starts as centre-back Sweety Devi was forced off due to injury in just the eighth minute and replaced by Manisha Panna. With the Indian defence still finding its feet after the sudden jolt, the Nepalese forwards made the most of the situation as captain Niru Thapa scored from close range, thanks to a low ball from the left flank. In just the 29th minute, coach Rocky made a tactical switch by replacing Anju with the experienced Kamala Devi. The move paid rich dividends just eight minutes later as Kamala leveled the score for India after some excellent play by Sanju from the left as she cut past her marker and delivered an inch-perfect cross.